Beach and boating season is near, and it is important to know that not all dogs can swim. It's not just that they don't want to swim; they really can't do it. Dogs will do "the paddle" when they are in water, but that doesn't mean that they like being in water, that they're good at swimming, or that they can even stay afloat. Even amongst breeds intended for swimming - like the Labrador Retriever - some individuals will dislike being in the water. The breeds having problems staying afloat is generally the ones with large, heavy chests and short muzzles. 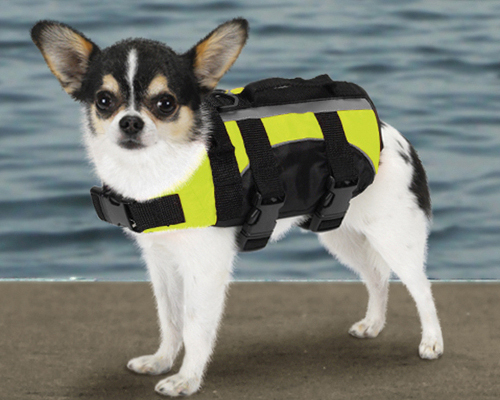 They might swim well enough to splash around in shallow water with a life vest and careful supervision, but some breeds can't even do that. Bulldogs are the worst breed when it comes to water. They sink no matter how much they struggle to stay afloat, and many breeders and rescues require home checks to make sure that any pools or ponds are fenced off. Some also require an emergency monitor that will alert when something breaks the surface of the water. Even those of us that can swim need to always be monitored! I absolutely agree. A doggie can be more tired than they think, they can get stuck in something, there are undercurrents... All sorts of bad things can happen. One of my friends had a bulldog for many years. Her husband thought the dog was just afraid of water, said, "All dogs can swim" and tossed the dog into the water. He had to jump in and save the poor thing.